Home » Change a girl’s life today through our Grow A Girl programme! In Uganda, 85% of girls drop out of school early and almost half are married before they reach 18. Act4Africa, with your help, aims to combat this shocking statistic by sowing the seeds for a healthy and educated life. But the clock is ticking… watch this 3 minute video to understand more. Just £25 a month will keep one gifted, talented yet extremely vulnerable girl in school. Act4Africa identify girls needing your support through our community programmes. Find out more about this below. Meet Sharon, Brenda and Edith, three of Act4Africa’s teenage Peer Educators. Peer Educators are adolescent girls who deliver our programme of interactive gender equality education to the youth community, providing an effective and sustainable means to educate young Africans about HIV/AIDS related issues. Cultural gender norms mean women and girls are more vulnerable to HIV – they lack control over their education, their bodies, their livelihoods and ultimately their health. In sub-Saharan Africa women constitute 60% of people living with HIV. Over many years Act4Africa has assisted young women faced with low paid work, early marriage, unwanted pregnancy, sexual and domestic violence, by bringing them into education and training them as Peer Educators. Challenging endemic gender inequality in rural communities often involves going against cultural norms but Act4Africa has so far been successful in bringing many young women into education. We have now taken it a step further by establishing these young women as future leaders and role models in their communities. Peer Educators are designed to spread Act4Africa’s educational programme to their communities, with a particular focus on the young and the vulnerable. We believe the best people to deliver our programmes are within the communities themselves. Why should I sponsor a Peer Educator? Grow A Girl sponsorship provides Act4Africa with a means to support our Peer Educators. Educating these individuals is vital to both Act4Africa’s future mission and to the sustainability of the Peer Educator scheme. Your money goes directly towards assisting our Peer Educators to deliver Act4Africa’s message. How does a Peer Educator benefit from my sponsorship? Your monthly donation allows Act4Africa to cover her school fees entirely. Peer Educators are selected for sponsorship by Act4Africa according to strict criteria including their educational potential, honour and commitment as well their personal vulnerability and family situation. 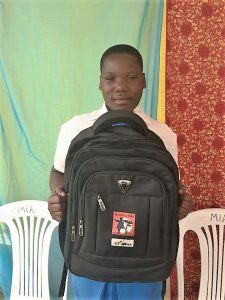 As well as her school fees she is provided with shoes and school uniform, together with a backpack full of educational resources. She will also receive a regular supply of sanitary protection allowing her to maximise her time in school each month. The girls also get regular support visits from the Act4Africa team. A donation of £25/month covers the complete school costs for one girl, her training as a Peer Educator and on-going support from the Act4Africa team. It also provides additional resources which will allow Act4Africa to expand the scheme further. In addition to regular monthly donations, Act4Africa also welcomes one-off donations towards the scheme. Sponsorship not only contributes to changing the lives of young women by empowering them to further engage with their peers and community at a grassroots level, it also offers a number of donor benefits. Both regular and one-off donors will receive an update on the girls progress every six months. Regular donors will receive additional correspondence from individual girls and will be invited to submit return correspondence to a designated address. Information explaining the programme, the benefits of sponsorship and the work Act4Africa does will be sent to all donors upon initial registration.